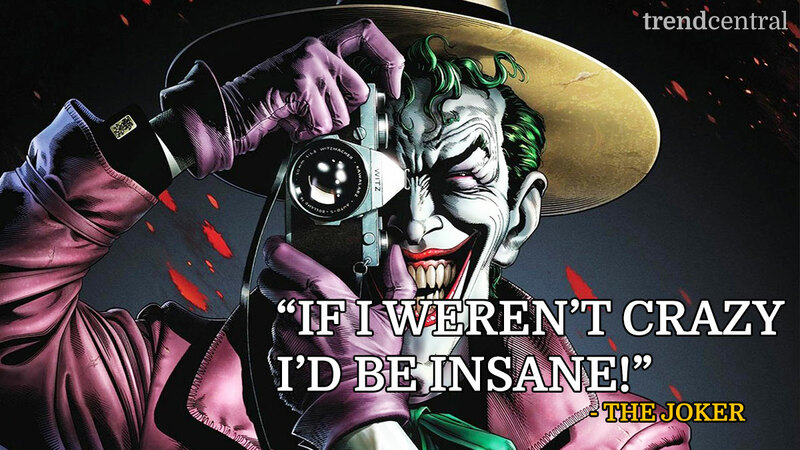 The Joker is undeniably one of the most popular characters in comic book history. Anyone who is into comic books knows that whatever he quotes is either hilarious from his point of view, or can strike a chord with the grown up and perhaps disillusioned part within all of us. You shouldn’t pay heed to the ramblings of a madman, but sometimes you can’t help but listen when the Joker speaks. He is one of the most, if not the best, quotable villains of all time. His lady Harley Quinn also has some brilliant lines of her own, and put together; they have put down some fantastic albeit slightly disturbing quotes. Even if someone is not really into the comic universe, they will know who the Joker is, thanks to the amazing portrayal of the character in Christopher Nolan’s “The Dark Knight” trilogy by none other than Heath Ledger. 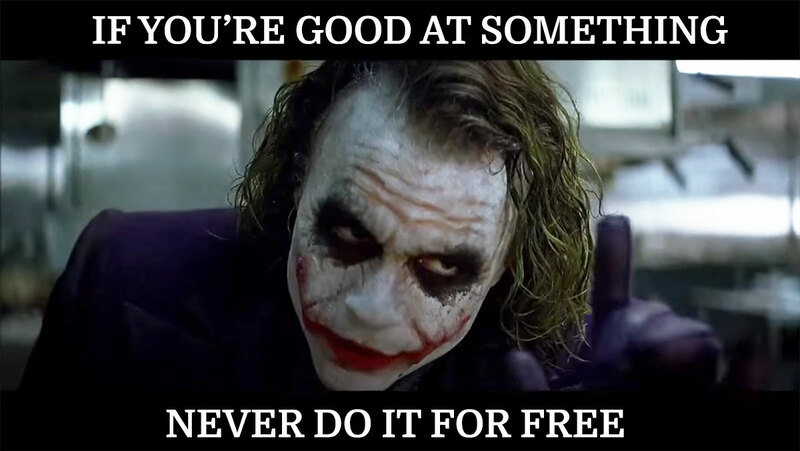 There have been so many stellar actors that have taken on the role of this lunatic criminal, from Jack Nicholson in Tim Burton’s “Batman”, Jared Leto in “Suicide Squad”, and even Mark Hamill in his iconic voice acting for the Joker in Batman: The Animated Series, but Ledger’s Joker really stands out from them all. His role in the second installment of Christopher Nolan’s “The Dark Knight” trilogy earned him an Academy Award for Best Supporting Actor posthumously, and his performance was praised by both critics and fans alike. In fact, there were moments when he overshadowed fellow actor Christian Bale’s Batman, making fans love him more than they did the Caped Crusader. Bob Kane and Jerry Robinson created the character together after creators decided that having a recurring villain would add something great to the comics. Instead of the hero being the primary focus, having a villain like the Joker would add a lot of character to Batman as a hero. They are like Sherlock Holmes and Moriarty, like David and Goliath—someone who could test the limits of the hero. The result was sheer brilliance and utter madness rolled into the character we now know (and weirdly love) as Joker. The concept behind the character of the Joker is just as exciting. A psychotic criminal who did all sorts of heinous crimes like poisoning people with his signature joker venom, shooting and torturing Barbra Gordon to break down her father Commissioner Jim Gordon and even torturing and killing Jason Todd, all for fun? All as part of a hilarious joke in his eyes? Now that is seriously twisted. And that was just the tip of the iceberg. But it’s because of this that he is arguably one of the best villains ever created. He doesn’t bat an eye before committing any sort of crime, nor does he hesitate to stab his henchmen or partners in the back. He has no sense of loyalty, remorse, morals or feelings. And time and again he has shown that he can never be trusted, not even to tell his own story with truth. The only person Joker does seem to have some sort connection with is Harley Quinn. Harley’s character is one of the biggest and most popular in the comic universe right now. Go to any Halloween party or comic convention and you will see someone or the other dressed as Harley Quinn, be it the original one or the one played by Margot Robbie in the movie “Suicide Squad”. While she is one of the biggest characters in DC comics as of now, she debuted on television in Batman: The Animated Series in an episode called “Joker’s Favor”. While she was initially supposed to be just a one-off henchman for the Joker, her character ended up growing. Harley was so popular that the creators had to give her an origin story, which they did with the famous comic “Mad Love”. This comic shows how she ended up as the sidekick to the Jester of Genocide. 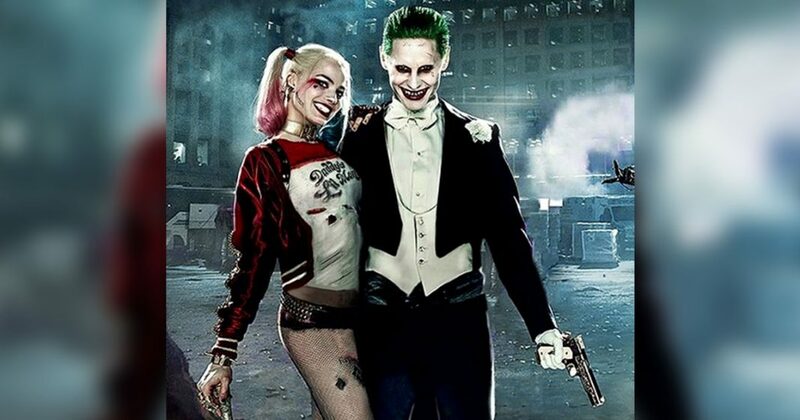 The relationship between her and Joker is as crazy as it gets. She was originally Harleen Quinzel, a star gymnast at the Gotham State University and a student at their psychology department. When she started working as a psychiatrist for Arkham Asylum is where she first met Joker. She finally landed a session with him after three months of trying. 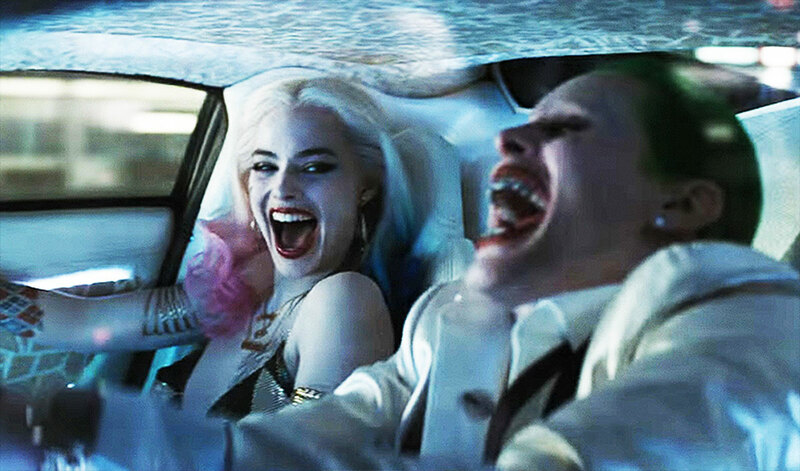 Despite several warnings by the other doctors about Joker’s manipulative nature, she falls for him, eventually going crazy enough to change herself to Harley Quinn and break him out of Arkham. Another origin story revolves around Joker pushing her into the vat of chemical that turned him into what he is. Their relationship is anything but perfect though, but that’s what you get when two psychopaths fall in love with each other. Joker regularly abuses Harley, and doesn’t care much about her affection. He usually beats her up, abandons her in dire situations and as shown in “Mad Love”, doesn’t even appreciate her capturing Batman. Despite that, Harley is still in love and hopes for a future with her Puddin’. She shows signs of Stockholm syndrome, as she regularly defends him and even blames herself for his actions. However, she does get tired of him and befriends Poison Ivy for a stint of crimes across Gotham. Joker shows some signs of missing her, pointing out how well she managed his “household”. Eventually, he wins her back, despite Poison Ivy’s warnings against him. Well, these two might be off their rockers, but you can’t deny that they have chemistry between them that just works. It’s important to keep in mind though that such toxic relationships are bad in real life, and one should read the comics for entertainment only. Anyone dealing with such abuse or torment in any relationship should seek help. They might have some tender moments, but for the most part, these two are the embodiment of what not to do in a relationship! To round it all off, here are some unforgettable quotes from the Clown Prince of crime and his (almost) favorite plaything. 1. “I’d just to like to say, if there were no Batman, there’d be no Joker and I never woulda met my Puddin!! Thankyou, Batman! 0. After all this time–all these years–you and I have history. I know what you think of me. You think I’m just a doll. A doll that’s pink and light. A doll you can arrange any way you like. You’re wrong. Very wrong. What you think of me is only a ghost of time. I am dangerous. And I will show you just how dark I can be. These two might not be perfect, but they are crazy enough to be unforgettable. Together, they have some of the most notable quotes from all of Batman’s rogue gallery, and you can’t help but wonder what else these two will be up to next!